It all started a very long time ago right here in our ancient neighborhood of Handigaon. In those days the distinction between people and divinities was not so clear as some people today think it is. Young god Bhat fell in love with beautiful goddess Bhateni. Sadly, he was of high caste and she of low. For this reason they were denied permission to marry. Like young people, young divinities too are prone to follow their hearts; Bhateni and Bhat eloped. As punishment, they could neither rise to heaven nor could their feet touch the ground. They would remain forever suspended, referred to as the hanging gods. Despite this awkward predicament, they managed to have a child. When Bhat and Bhateni went to work in the fields at harvest time, they forgot to cover the baby with the little pyramid, three-pole tent that Nepalis use to shield infants from the sun. An eagle swooped down and grabbed the unprotected child in its talons, but the divine power of the parents kept it from carrying the baby away. Even today Bhat and Bhateni hang suspended two blocks from our house in the BhatBhateni Temple across the street from the Bhatbhateni supermarket. Bhateni's mother Tundaldevi lives about a kilometer north in her own temple. Tundaldevi is a form of Durga, wife of Shiva and Divine Mother of the Universe. In her is vested the Shaki or Supreme Energy that controls the mysteries of life and death. All Mother Goddesses who emanated from Durga are called Devis, as in Tundaldevi. 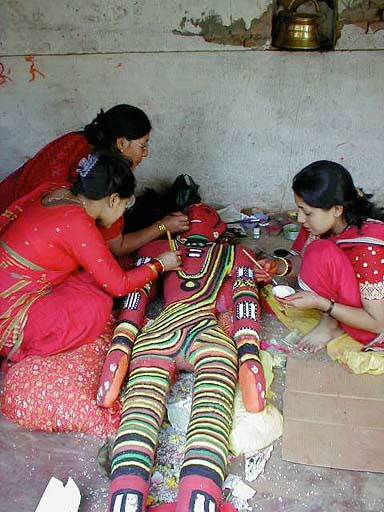 As with most forms of Durga, Tundaldevi is extremely fond of fresh blood. She wears a long necklace strung with human heads. It is prudent to stay on her good side with generous offerings. Again back in olden times, Tundaldevi and her daughter Bhairavi were visiting Gahana Pokhari, the pond right in our front yard. (I am not clear whether this is the same or a different daughter than Bhateni. When I tried to clarify this with people in the neighborhood, they looked at me like what difference does it make?) Somehow, the goddess lost a jewel in the pond. The pond is normally guarded by Naga or Snake gods, but since Tundaldevi is so powerful, she went right in to search for the jewel, and hence the name jewel pond. Every year at this time, Bhat and Bhateni and their little child still in the clutches of the eagle are carried on people's shoulders to visit Bhateni's mother Tundaldevi at the Tundaldevi Temple. Even though it seems a bit rude, the next day, in the dark of morning, Tundaldevi leaves in a procession to Handigaon where she is placed in a beautiful tiered, temple-like khat. 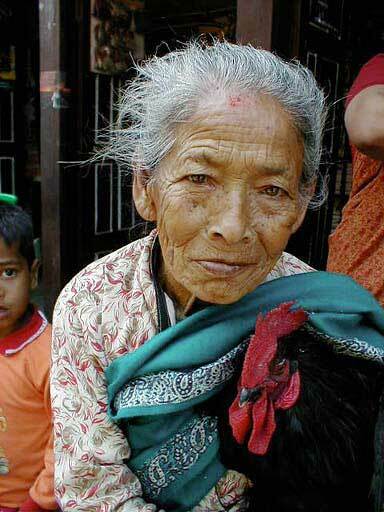 About the same time her daughter Bhairavi is brought from Nuwakot and placed in a sort of kiddy khat. From early morning until late afternoon, they are slowly paraded through the five or so blocks of Handigaon, stopping about every 30 feet or so to receive offerings, including blood sacrifices. The procession culminates at Gahana Pokari with a reenactment of the search for the jewel. I am not sure how all of these events fit together. They have all been related to us in bits and pieces by people in the neighborhood. (Things fitting coherently together is of absolutely low priority here.) From these events the Newars have constructed a wonderful neighborhood festival that is at least 400 years old, a festival mentioned in no guidebooks. 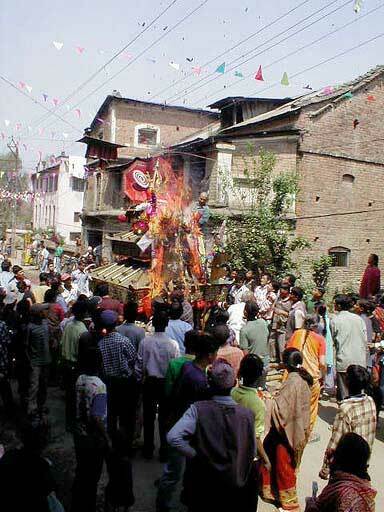 At the outset, two tall poles topped with greenery are erected at either end of the neighborhood to announce the beginning of the festival. In olden days, when all of the houses were low, these poles could be seen for miles around, and the people of the valley knew it was time to go to Handigaon. Photo A. Children examine the khat parked on Handigaon's main street the day before it was used to transport Tundaldevi from her temple to Handigaon for the festival. Photo B. In preparation for their journey to visit Tundaldevi Temple, Bhateni, Bhat, baby and the eagle are taken down and given a thorough repainting in an open fronted resting-place for pilgrims beside the temple. 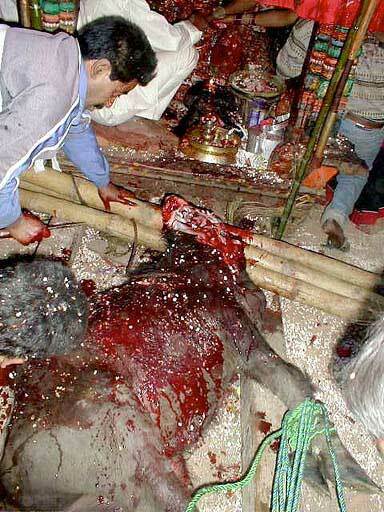 This is the only time that non Hindus can see more than the dangling legs of the hanging divinities. After much worship and offerings, the god family was whisked away in a mad procession, with us included, to Tundaldevi Temple. Photo C. Fully attired and adorned, the divine family is properly re hung, with baby in the talons of the eagle at the far right. All day long people came with offerings of food, flowers and animals; they waited in long lines to touch or kiss the feet of Bhat and Bhateni, who have special responsibility for the healing of children. Photo D. The next day Tundaldevi is removed from her traveling khat and installed in her regal processional khat resting on street in Handigaon. From daybreak people line up to make offerings and contribute decorations for the khat. While chickens are killed beside the khat, the heads of goats and here a buffalo are stuck into the khat where their throats are cut and the blood flows fresh into the bowl in front of Tundaldevi. 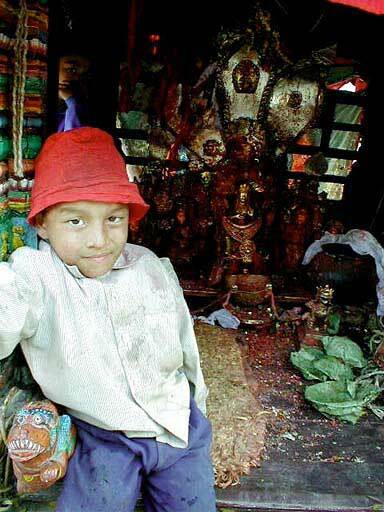 A priest sits with the goddess in the tiny space of the khat, making sure that Tundaldevi's blood thirst is quenched. 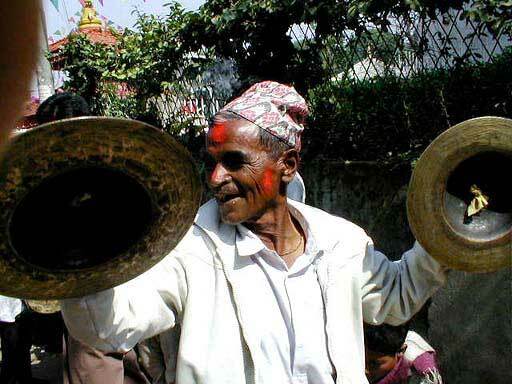 Photo E. Music is everywhere: drums, cymbals, gongs, and reed horns often lubricated with home brew. 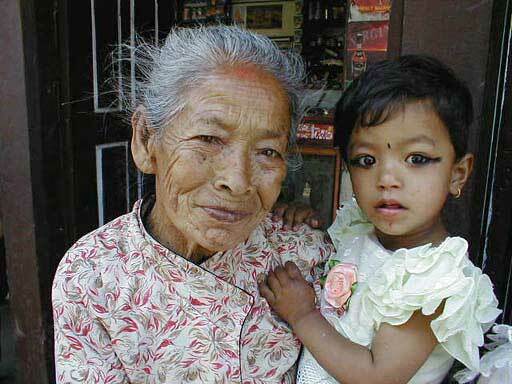 Photo F. A grandmother holds a young girl with her eyes outlined for the festival. Photo G. After several stationary hours, Tundaldevi's khat and the daughter's smaller khat were laden with decorations. Finally, the worshipers thinned enough for the slow procession to begin to make its way at about 100 feet per hour through the neighborhood. I climbed on a 55-gallon drum for a better look when suddenly the decorations on Tundaldevi's vehicle shot up in flames, apparently ignited by a butter lamp from one of the offerings. 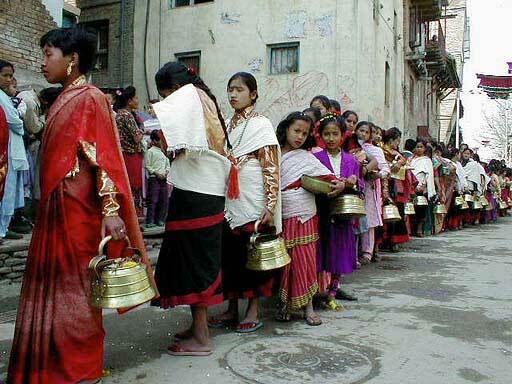 People were deeply concerned that this was a bad omen foretelling something bad for the people of Nepal. Since a calamity happens nearly every day here, it seems most likely that this prophecy will prove correct. When people realized that I had taken a picture of the fire, many were eager for a copy. I agreed to give one to the Handigaon ward office, for the record, as one person put it. Photo H. By the time the goddess reached her doorstep, fortunately the grandmother had substituted a handsome rooster for her granddaughter. 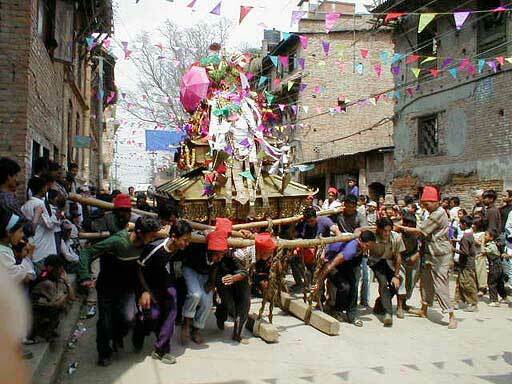 The rooster was not being held tightly just to see the procession. Photo I. It took 40 or 50 young men to carry the heavy khat crashing, scraping and teetering through the meager streets of Handigaon. Things might have gone easier if they had all moved in the same direction at the same time, but that is an experiment that was never tried. Photo J. Every few houses had a large clay slip square marked on the street where the goddess first, followed by her daughter, was obliged to come crashing to the ground amidst shouts of triumph by the bearers and the onlookers. 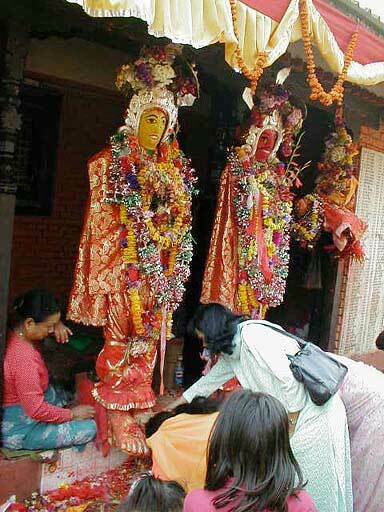 At each of the dozens of stops, both the mother and the daughter goddesses were thronged by devotees. With additions at each stop, decorations lost in the fire are now fully replaced. 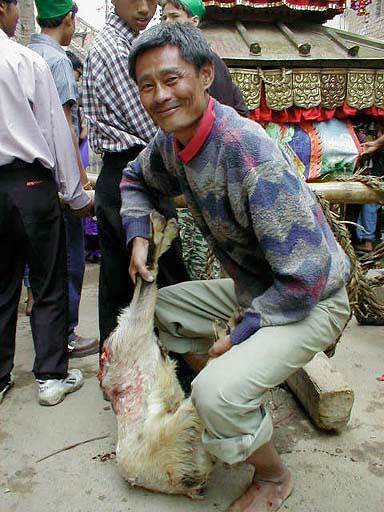 Photo K. A man very proud of his goat offering wanted his picture taken with the now headless animal. Photo L. Two young spectators reflect the wonder of the occasion. 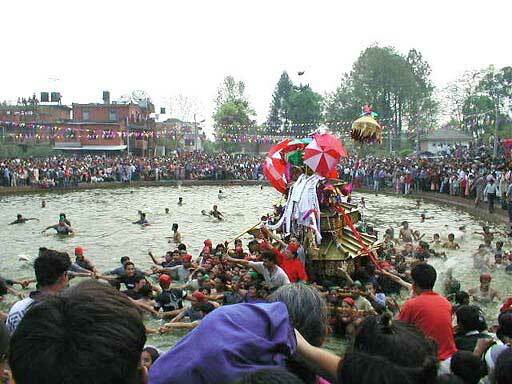 Photo M. With her bearers whipped into a frenzy, Tundaldevi enters Gahana Pokhari to search for the lost jewel. She makes a symbolic circle within the pond while her daughter circumnavigates beyond the crowd. Just to the left of the red umbrella, you can see our house. When the mother's khat emerged from the pond, the daughter's khat bowed three times in homage. Gahana Pokhari, which had become a swamp, was recently renovated and turned into the jewel of the neighborhood. 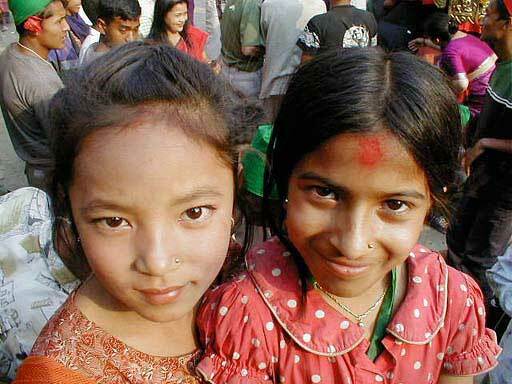 Most of the $30,000 for the project was raised privately in what may be the most successful development project in Nepal. Photo N. The next morning, Tundaldevi rests at the main intersection in Handigaon. Her blood bowl decorated with skulls sits in front of her. Photo O. In the early afternoon, the festival revs up again. 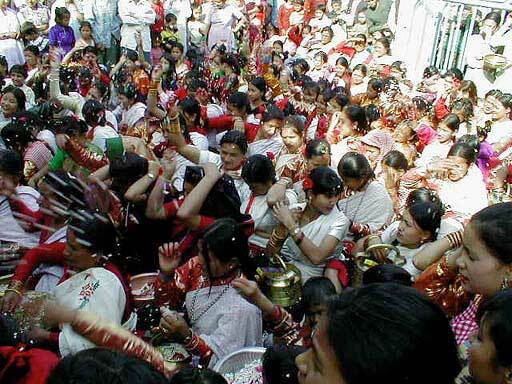 Nearly 200 women and girls in traditional Newari dress and carrying offerings lead the neighborhood in a raucous procession to BhatBhateni Temple. The divine family has returned and is hanging outside, awaiting offerings, including a goat. Photo P. At critical points in the sacrifice, the women throw rice and popcorn. Photo Q. 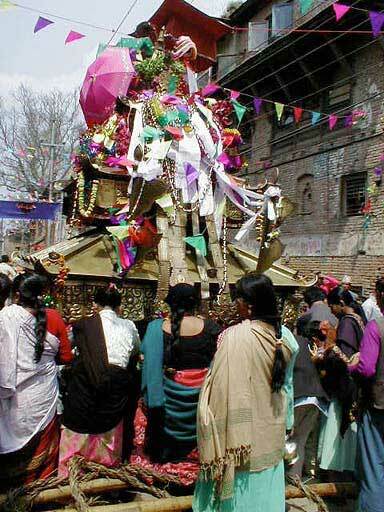 The procession of women, bands and inebriated revelers then visits Tundaldevi in her khat at the intersection. To satiate her for her journey home that night, she receives another water buffalo, here covered with popcorn and rice thrown by the women. Van Zandt was never like this.